During the course of his earthly teaching, Jesus had many opponents and detractors. His words disrupted the social and political orders, as he invited us to a better way, a kingdom-oriented way. In Matthew 22, several sects were trying to trap Jesus with their rhetoric. In the midst of a heated conversation, a pharisaical lawyer baited Jesus with the question, “Which is the greatest commandment?” Though he was trying to expose Jesus for his lack of knowledge, Jesus didn’t hesitate with the perfect, definitive answer. He quotes the Torah, from the book of Deuteronomy: “‘Love the Lord your God with all your heart and with all your soul and with all your mind.’ This is the first and greatest commandment” (Matt. 22:37–38). There are many good definitions of worship. And one of my favorite descriptions of worship comes from these words of Jesus, which capture not only the great commandment but also the essence of what worship is. Worship is an expression of love. And love happens within the context of a relationship. God loves us. He reveals that love to us. And we respond to that love by loving him back with our songs, with our prayers and with the way we live our lives. Jesus reveals that our loving God loves us with all that he is and desires all that we are. We worship him with our hearts, from the core of who we are. We worship willfully and purposefully as an expression of our identity in Christ, from our true self. And we worship with an emotional love, for our God is an emotional God. He grieves for us when we grieve and celebrates with us when we celebrate, and his joy permeates this universe. We also worship him with our minds, our intellects, grounded in the Word of God, able to understand and discern his truth and apply it in a way that’s meaningful and life-changing. Worshiping God is a mindful act involving our thoughts and meditations, our memories and emotions, our values and beliefs and our conscience and convictions. We know the will of God, as well as God himself, in great part through our minds. We also worship with our strength. We worship with expressions of our body, with musical instruments, with singing, with raising our hands and bowing our heads. And we also worship in strength through acts of service, acts of sacrifice, acts of putting others first and ourselves last by loving our neighbors and reaching out to the disenfranchised and the broken. 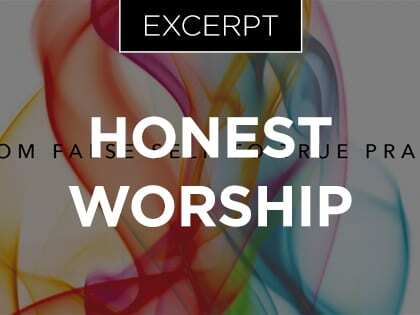 In a sense, worship is incarnated—embodied in flesh—through our physical bodies. These are all acts of worship that require our strength. This is what it is to have the soul of a worshiper, to worship with heart and mind and body. To worship with the totality of who we are. Willard adds, “When we are like this, our whole life is an eternal one. Everything we do counts for eternity and is preserved there (Col. 3:17).” We’re invited into a full life that’s not our own, to live joyously and abundantly in his kingdom, a reality that’s greater than what we can see. Our God desires us to live fully soul-integrated lives, and he also desires that our worship come from fully integrated souls. That’s why a proper understanding of the soul is important to worship. Think about the most transcendent and inspired moment of worship you’ve had. Most likely, it occurred in a time of total engagement, when you had surrendered your whole self to worshiping God. In such moments, our worship is an activity that allows our will (intentions), mind (emotions, passions, intellect) and body (physicality)—the totality of our soul—to align to God. These are the deep, ethereal convergences of heaven and earth when we feel most fully alive, times when worship feels like brokenness and wholeness, surrender and freedom, all at the same time. I’m becoming more and more convinced that this is a taste of heaven, when our soul is fully aligned to itself, to God, to all creation. Now a disclaimer. These passages in Deuteronomy and in Matthew aren’t meant to be an anatomy lesson, describing heart, soul, mind and strength as discrete parts of a person. They are much more interconnected and blurred than that. We are made in the image of God, not as simple parts strung together but as complex, interconnected, wondrous beings. What we believe, what we feel, what we experience and how God meets us in that are all connected somehow in some mysterious and God-breathed ways. We use the words heart, soul, mind and strength in conceptual and blurry ways, and so does the Bible. So don’t get caught up in the definitions. We can safely assume that when Jesus used the words heart, soul and mind, he meant for us to love God with all that we are, the entirety of our being. Previous article6 Leaders: How Can the Church Engage Culture?